At the rate plastic bottles and the like are entering the world’s oceans, beachgoers may need to start wading long before they reach the water’s edge. 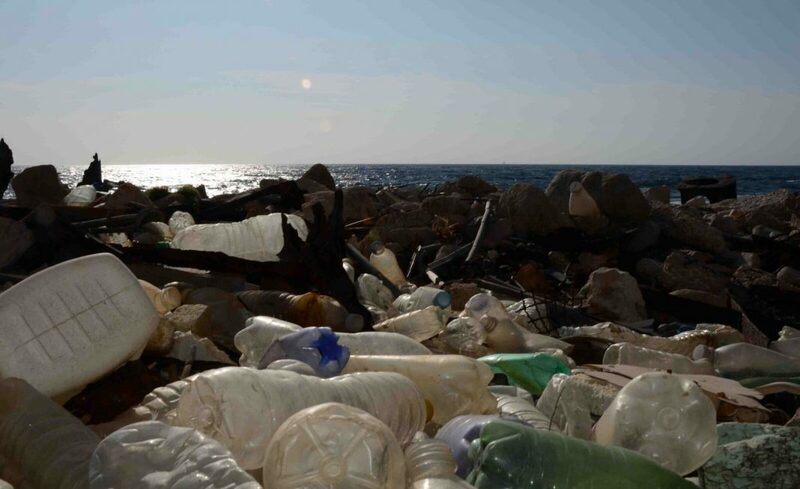 And the plastic tide has yet to turn, despite the development of mechanical and chemical recycling technologies. Unless a new kind of recycling technology is developed, natural scenery may disappear beneath waves of human-made polymers, and wildlife may be left bobbing in civilization’s synthetic wake. Curiously, the best kind of recycling technology may be one that simply negates one of plastic’s greatest advantages: its durability. Such a technology may soon be at hand, now that scientists based at U.S. Department of Energy’s National Renewable Energy Laboratory (NREL) and the U.K.’s University of Portsmouth have developed an improved version of a natural plastics-eating enzyme. Details of the scientists’ work appeared April 17 in the Proceedings of the National Academy of Sciences (PNAS), in an article entitled “Characterization and Engineering of a Plastic-Degrading Aromatic Polyesterase.” This article describes how a plastics-nibbling enzyme from the bacterium Ideonella sakaiensis 201-F6 might be altered to give it a heartier appetite for polyethylene terephthalate (PET), one of the most abundantly produced synthetic polymers. Initially, the scientists had nothing more in mind than gathering 3D information about the PET-degrading enzyme, the PETase, so that they could better understand how it works. During their study, however, the scientists inadvertently engineered an enzyme that is even better at degrading the plastic than the one that evolved in nature. The 3D structural work was straightforward enough. The NREL and the University of Portsmouth collaborated closely with a multidisciplinary research team at the Diamond Light Source in the U.K., a large synchrotron that uses intense beams of X rays to probe matter at the atomic scale. Using the Diamond Light Source’s beamline I23, the scientists generated an exquisitely detailed ultra-high-resolution 3D model of the PETase enzyme. With help from the computational modeling scientists at the University of South Florida and the University of Campinas in Brazil, the NREL/Portsmouth team discovered that while PETase looks very similar to a cutinase, it also has some unusual surface features and a much more open active site. These differences indicated that PETase must have evolved in a PET-containing environment to enable the enzyme to degrade PET. To test that hypothesis, the researchers mutated the PETase active site to make it more like a cutinase. And this is where the unexpected happened. I. sakaiensis 201-F6, which was discovered in the soil of a Japanese PET bottle recycling plant more than a year ago, was found to produce the original PETase, but this enzyme doesn’t work fast enough to solve plastic recycling at the industrial scale. The problem is that PET has a highly crystalline structure, one that resists degradation. Although PET can be recycled, most of it is not. PET that is recycled often exhibits inferior material properties as well. In addition, PEF plastics, although bio-based, are not biodegradable, and would still end up as waste in landfills and in the seas. Yes, the improvement is modest, but the discovery that PETase has room for improvement is encouraging. It suggests that additional protein engineering could produce enzymes capable of digesting plastics that would otherwise last for centuries.